Gazebo's mailing list which used to be hosted on Google Groups is officially retired! From now on, we invite the community to join us at community.gazebosim.org for general discussion and announcements regarding Gazebo and related projects. Gazebo Answers, at answers.gazebosim.org, will continue to be the place for technical questions and answers. See you at the community! The Space Robotics Challenge (SRC) came to a close last week with a wonderful celebration event at Space Center Houston. The celebration event brought together competitors and organizers over two days with tours of Johnson Space Center (JSC), team presentations, and an award ceremony. The SRC tasked teams with developing and displaying the ability of the Valkyrie (R5) robot to assist in a virtual NASA Mars mission. A prize pool of $1 million was available to successful teams. The following scenario served as a backdrop for the challenge. In the not too distant future, Valkyrie has arrived on Mars along with supplies ahead of a human mission. Overnight a dust storm damaged the habitat and solar array, and caused the primary communication antenna to become misaligned. Valkyrie must now repair an air leak in the habitat, deploy a new solar panel, and align the communication antenna. Teams developed software to control Valkyrie in order to resolve the problems caused by the dust storm. Gazebo was used as the simulation platform, with integration to a walking controller from Florida Institute for Human and Machine Cognition (IHMC). Additional ROS interfaces were provided by JSC. Each team was evaluated according to a scoring metric that considered the number of tasks completed and the time required to complete the tasks. Unique to SRC was a focus on completing multiple tasks sequentially, without falling. The winning teams were able to complete numerous tasks, even in the presence of significant network latency and bandwidth restrictions. Coordinated Robotics is a one-man team from California that has previously competed in other robotics challenges. Because dexterous control of a robot requires coordination between sensors and actuators, the team name of Coordinated Robotics was formulated. Hoping to win prizes and learn more about humanoids, Coordinated Robotics will focus on manipulation of humanoids to excel in the competition. Team Walk Softly joins the fray from upstate New York. The team name is reminiscent of a phrase often attributed to former President Theodore Roosevelt, "speak softly and carry a big stick - you will go far." Team members are coworkers at GE Global Research who have an interest in humanoid robots and decided to enter on their own time. The team is excited to see the innovative solutions that come out of this challenge. Ten robotics and software specialists representing six countries make up Team Olympus Mons. Olympus Mons is the name of the largest discovered volcano in the solar system and is located on Mars, where the simulated competition will take place; this is where they gained inspiration for their team name. The team members are all current or former employees at PAL Robotics who have stayed in touch throughout the years. Although they are not eligible for prize money, Team Olympus Mons entered the competition to have fun and become more involved in simulated space exploration. ZARJ is represented by four engineers and programmers based in Minnesota. The Team has been interested in NASA's Centennial Challenges for the past four years, but did not have the time or resources to enter the contests. Finally, ZARJ was able to enter the Space Robotics Challenge before the deadline arrived. If ZARJ is awarded prize money, they plan to distribute it equally between team members to defray some competition travel costs. Congratulations to all teams that participated in the competition! Reposted from the OSRF Blog. We are happy to announce the final results of the Agile Robotics for Industrial Automation Competition (ARIAC). ARIAC is a simulation-based competition designed to promote agility in industrial robot systems by utilizing the latest advances in artificial intelligence and robot planning. The goal is to enable industrial robots on the shop floors to be more productive, more autonomous, and more responsive to the needs of shop floor workers. The virtual nature of the competition enabled participation of teams affiliated with companies and research institutions from across three continents. While autonomously completing pick-and-place kit assembly tasks, teams were presented with various agility challenges developed based on input from industry representatives. These challenges include failing suction grippers, notification of faulty parts, and reception of high-priority orders that would prompt teams to decide whether or not to reuse existing in-progress kits. The IROS workshop is open to all, even those that did not compete. In addition to having presentations about approaches used in the competition, we will also be exploring plans for future competitions. If you would like to give a presentation about agility challenges you would like to see in future competitions, please contact Craig Schlenoff (craig.schlenoff@nist.gov). 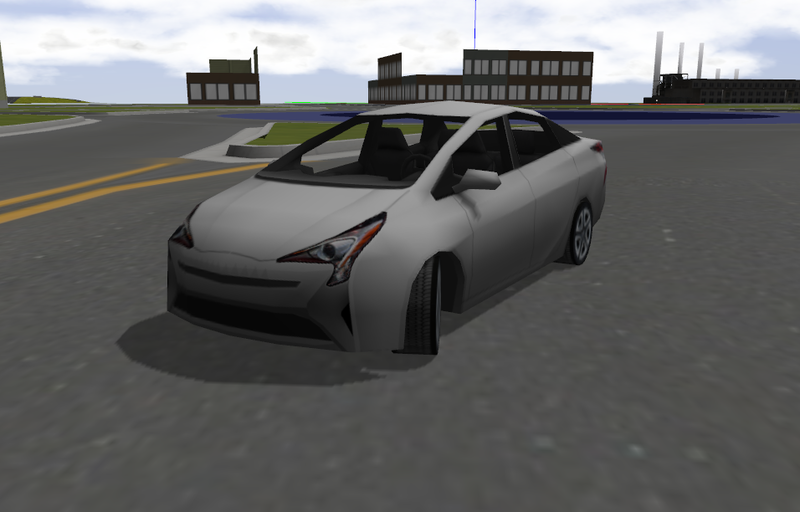 We are excited to show off a simulation of a Prius in Mcity using ROS Kinetic and Gazebo 8. ROS enabled the simulation to be developed faster by using existing software and libraries. The vehicle's throttle, brake, steering, and transmission are controlled by publishing to a ROS topic. All sensor data is published using ROS, and can be visualized with RViz. We leveraged Gazebo's capabilities to incorporate existing models and sensors. The world contains a new model of Mcity and a freeway interchange. There are also models from the gazebo models repository including dumpsters, traffic cones, and a gas station. 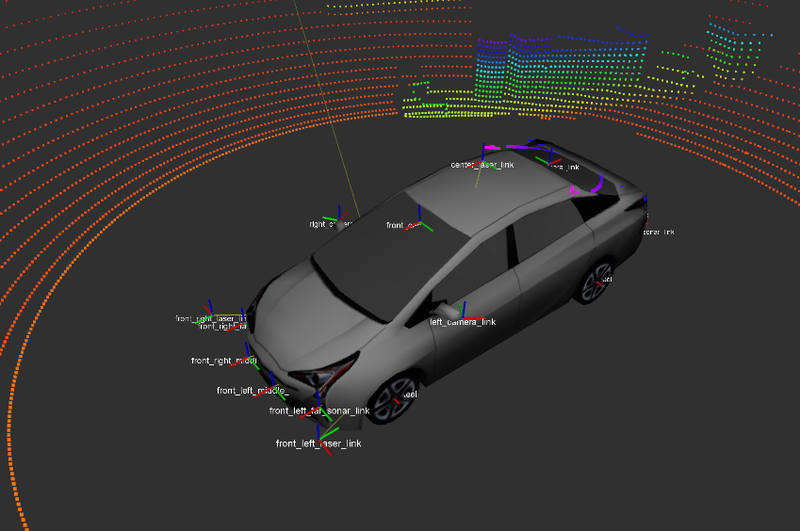 On the vehicle itself there is a 16 beam lidar on the roof, 8 ultrasonic sensors, 4 cameras, and 2 planar lidar. The simulation is open source and available at on GitHub at osrf/car_demo. Try it out by installing nvidia-docker and pulling "osrf/car_demo" from Docker Hub. More information about building and running is available in the README in the source repository. Gazebo 6.x and 5.x have reached the end of their lives. We will continue to answer questions about these versions, but we will stop fixing bugs. We are proud to announce the release of Gazebo 8. This version of Gazebo has short term support with an end-of-life on January 15, 2019. A major API change comes with Gazebo8. This API change centers around the transition from Gazebo's internal math library to Ignition Math. Please refer to the changelog and migration guide to help your transition. The ability to dynamically and programmatically add visual elements to Gazebo has been added through a visual marker interface. Visual markers can consist of simple shapes, lines, triangles, and text. Additional features associated with visual markers can be found through the gz marker -h command line tool. A C++ example demonstrates how to manipulate visual markers from a stand-alone application. We continually strive to improve Gazebo's user experience and offer features that benefit a wide audience. To this end, a feature rich plotting utility has been integrated with Gazebo. This utility supports plotting data from topics, models, and simulation parameters. Multiple plots can be created, and data can be exported to CSV or PDF files. Try inserting a model, such as the Double Pendulum, and press ctrl-p. Following the same rationale as the plotting utility, we are pleased to announce the integration of video recording in Gazebo 8. Simply select the camera icon on the right hand side of the tool bar to start recording into an MP4, AVI, or OGV file. Select the icon again to stop recording and save the video file.